It might be pink, blue, red, yellow, green or even black. Perhaps it’s a special affinity for traditional ball gowns, crinoline skirts, hats, hand painted flowers, parasols or fans. For figurine collectors, a special event, favorite colour or dress style, occasions or themes can become the inspiration for an entire collection. Once the inspiration takes hold, a ‘typical’ figurine collector, if there is such a thing, can amass anywhere from 60 to upwards of 100s of figurines, each one perhaps, in a red dress, if that is her particular theme. The reasons people collect figurines are as unique as the collectors themselves. But for most, at the heart of it all, it’s emotion. According to Dorothy Laponder, Founder of Dorothy’s Doultons in London, Ontario, for most collectors “It’s mostly about names and the emotional connections people have with loved ones who have those names.” By far the most popular inspiration for many is an attempt to create a personalized version of a Royal Doulton style family tree -- collecting figurines in the names of daughters and granddaughters. Needless to say, these collectors can become highly disappointed when a family member’s name is not created. Laponder often finds that for these ‘family tree’ collectors, the names can become even more important than the look of the figurine, and often takes precedence over actual spelling. In fact, “Most of my customers begin innocently enough, collecting the names of family, daughters, mothers, and in particular, grandchildren. Once their collection already includes many of their family members, and one granddaughter’s name is missing, when they find it, even if it’s spelled a little differently, the customer will buy it anyway, just to have the granddaughter figurine in the collection.” For example, if a collector has a new granddaughter named Hailee, and the only Royal Doulton figurine available is spelled Hayley, the collector has enough of an emotional connection to the name to still include it in her collection to symbolize her own Hailee. Linda DiMaria, a member of Royal Doulton’s Consumer Relations team for over 10 years and with the company and ICC Collectors Club for 14 years prior, gets constant requests from collectors seeking Royal Doulton figurines in the names of family members. The names requested run the gamut, including historical and period names, plus exotic, international and uncommon variations of popular names. That’s where Name Your Own and ‘sentiment names’ can help. While figurines with names such as Especially For You and My Darling are primarily purchased by a gift-givers, husbands, daughters or friends for collectors for special occasions, it is also an ideal solution when a sought after name is unavailable. While many collectors play this “name game”, others have specific colours or styles they look for. Some seek out particular poses or accessories (ie hats), others collect pieces by specific designers or modelers. Still others seek out pieces produced in a year significant to them, or ones that are signed by Michael Doulton at personal events. (Michael Doulton is a 6th generation Doulton). In her experience, many beginning ‘collectors’ typically start off by buying a single figurine, and slowly begin buying one figurine a month. She has noticed that after building up a collection of about 20 pieces, or a full cabinet, collectors begin to get fussier. According to Laponder, 10% of collectors have over 100 figurines, and most ‘typical’ collections number about 60 pieces. This is definitely true, according to Nada Pedley, renowned Royal Doulton designer and modeler. “Collectors are so proud of their collections,” she enthuses. “They get very emotional about their collections and when they meet me, they tell me the most amazing stories about how much their collections mean to them.” Throughout her special events and appearances, Pedley had the opportunity to hear it all from collectors who love her work and love figurines. 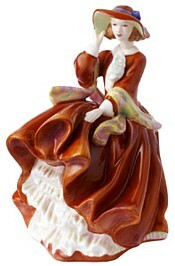 One particularly touching tale was told to her by a collector with over 300 Royal Doulton Pretty Ladies figurines. As she and her husband prepared for a somewhat lengthy trip down south for the winter, this collector kept gazing lovingly at her figurines, knowing how much she would miss the joy they brought her while she was away for several months. Her wonderful husband, sensing her feelings, decided to help her pack up a few treasured pieces to take along with them on their journey. Laponder herself is certainly an expert in this area. An avid collector for over 30 years, her store, Dorothy’s Doultons, is now celebrating its 15th year in business. She has a special interest in pre-war figures, and is part of a group of collectors who enjoy the thrill of finding that rare and unique figurine that few others have. They are constantly trying to grow their collections and accumulate new and different pieces and will sell or trade their own figures for more rare colour ways or pieces. Most importantly however, is still finding something that they like. With both these two notions in mind, Laponder recently commissioned Royal Doulton to create a new colourway of a favorite piece, appropriately called Dorothy. McIntosh has done the same, offering his customers a traditionally Scottish decorated piece, Wee Scottish Lass. The Shopping Channel has also fulfilled this niche and then some, by regularly offering its customers Royal Doulton figurines designed exclusively for them. Many of these have resonated so strongly with viewers, that TSC has commissioned Royal Doulton to create an exclusive TSC Figure of The Year just for them. The first in this series, Kate, was introduced last year and all 1500 pieces sold out within approximately three hours. Many figurine collectors take the education of their figurines upon themselves. They know about ciphers, back stamps, HN numbers, limited editions and more. 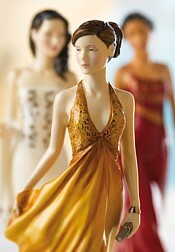 They can tell you not only what year their figurine was produced, but often the modeler or designer that created it. Many are part of special collectors clubs. 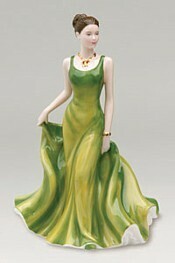 The Royal Doulton International Collectors Club, for example, has 3,000+ members in North America alone. Many read expert sources such as the Charlton Standard Catalogue, now in its 11th edition, or visit blogs, chat rooms, web sites and more to become as knowledgeable and connected to the figurine collecting community as possible. Pat Sage, an avid collector of Bunnykins, Royal Crown Derby and Pretty Ladies figurines, and also a veteran 10 year Sales Associate at a Royal Doulton company store, explains. “People rarely set out to collect. But they buy one or two, and then it multiplies, almost before they realize it. Between gifts from loved ones and self purchases, there is always a piece that just "fits the person or the occasion." Sage is now focusing her own collection on Bunnykins white china figurines and tableware created from 1937-1940. It’s an ideal example of how meticulous collectors can be in seeking their special pieces. Indeed, when Michael Doulton, who had met Sage during a previous personal appearance in Toronto, recently presented Sage with a special find – a Bunnykins bank she was seeking, Sage was thrilled. Doulton, a fan favorite, travels the globe for signing events and guest appearances. He is extremely popular and typically travels 9 months of the year, introducing new pieces and meeting fans in stores and on The Shopping Channel – all to the delight of collectors anxious to get their figurine signed in gold. While most collectors still place the figurines in curio cabinets, others build more customized spaces, shelves, even rooms to display their collection. More contemporary collectors get more creative, using their fireplace mantle, powder room, coffee table, window sill and more to integrate their prized pieces into their everyday world. All in all, figurine collecting shows no signs of waning, as new and younger people inherit collections, or receive a gift and slowly create their own theme. It is the emotion these collections inspire in their owner that matter and this is what continues to drive them to seek out more pieces which reflect their lives and preferences in much the same way that art collectors do. In this hectic, fast paced, digital and technology driven world, the genuine pleasure provided by Pretty Ladies in a cabinet or shelf, the thrill of finding that perfect gift or a rare, sought after figurine serves as a delicate reminder that whether their ideal choice is pink, blue, or red, for figurine aficionados, life’s greatest pleasures can still be found without wires or cables.